Chief of Air Staff of Indian Air Force Air Chief Marshal Birender Singh Dhanoa called on Chief of Air Staff of Bangladesh Air Force Air Chief Marshal Masihuzzaman Serniabat at Air Headquarters on Monday (Feb 11). During the meeting, they exchanged greetings and discussed issues of bilateral interests, BSS reports citing an ISPR release. The two Air Chiefs also expressed hope to continue mutual cooperation to strengthen the existing relationship between Bangladesh and Indian Air Forces. 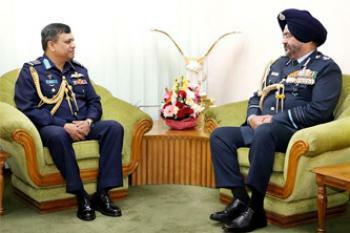 The Bangladesh Air Force chief extended his sincere thanks to Indian Air force Chief for visiting Bangladesh. Earlier in the morning, the Indian Air Force chief visited “Shikha Anirban” at Dhaka Cantonment and paid homage to the Armed Forces martyrs by placing a wreath there. On arrival at the Air Headquarters, the chief of Indian Air force was presented a guard of honour by a smartly turned out BAF Contingent. Later, he planted a sapling on the Air Headquarters premises. During his stay in Bangladesh, Air Chief Marshal Birender Singh will visit the Prime Minister’s Office, Army Headquarters, Naval Headquarters, Armed Forces Division, National Defence College, BAF Base Bir Sreshtho Matiur Rahman and BAF Base Zahurul Haque, the release said. He will also visit different Flying Squadron, 214 Maintenance and Overhauling Unit and Bangabandhu Aeronautical Centre of BAF Base Bangabandhu. The chief of Indian Air Force along with his spouse and a three-member delegation arrived in Bangladesh on February 10 on a five-day official visit. “It is expected that the visit will play an important role in strengthening the existing friendly relations between the Air Forces of the two countries,” the release added.